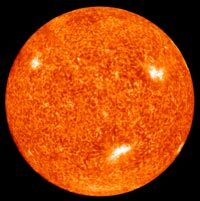 Solar activity is monitored constantly via a network of satellites and (ground) stations all over the Solar System. The data is gathered at the Solar Observatory on the Moon, near Lunapolis. At the SO the data is fed into STAN I [State of The Art Neuroputer I], which calculates the weekly, monthly and annual Solar weather forecasts. Active Region 2052B of the Sun burst into activity early this morning. A coronal mass ejection (CME) was hurled into space, directed towards Mars and part of Astropolis. A CME warning has been issued and ExTerra residents of the affected areas are urged to move to the designated radiation shelters. ExTerra residents of other areas are urged to remain alert. Solar activity has been above average the last couple of months, around 10-20% of the 2012 Sun Storm event. Because we are currently in a Solar Maximum above average Solar activity is expected. Model statistics predict one major 40% event and 3 20% events within the following 10 months. Starting from 2053 Solar activity is expected to decrease again.